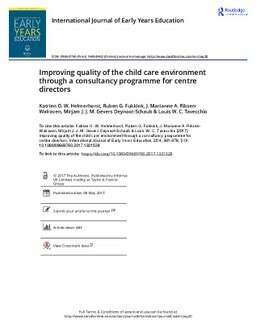 This study examined the effects of a newly developed on-site consultancy programme to improve global quality of the child care environment in non-parental child care centres for 0- to 4-year-old children as measured with the ITERS-R/ECERS-R. Using a randomised controlled trial with a pretest, posttest, and follow-up test, we compared 35 experimental group with 33 control group. The consultancy programme comprised three consultations in total. Analysis on the items that were specifically targeted during the consultancy showed a significant improvement on these targeted items between pretest and posttest and between posttest and follow-up. The effect of the consultancy programme on the total scores (including the non-targeted items) was not significant.